This week, we move on to 2 Samuel and a new king (David). As Israel becomes unified, we start with chapter 5, and by chapter 7, we will see the promise of our Lord Jesus from the house of this king. Each weekend, I am now posting a small PDF of one week of chapter summaries (on the website’s “Summaries” page), current to the beginning of the previous week. I have posted the summary for Week 19 (May Week 1) of the schedule I am following. This short PDF document contains condensed comments about 1 Samuel 8, 9, 10-11, 12 and 13, with hyperlinks to the ESV version of each chapter for listening or reading, and joins the summaries for other weeks already posted there. As we forge ahead in chapter 28, Saul has gone from bad to worse. Samuel has died. 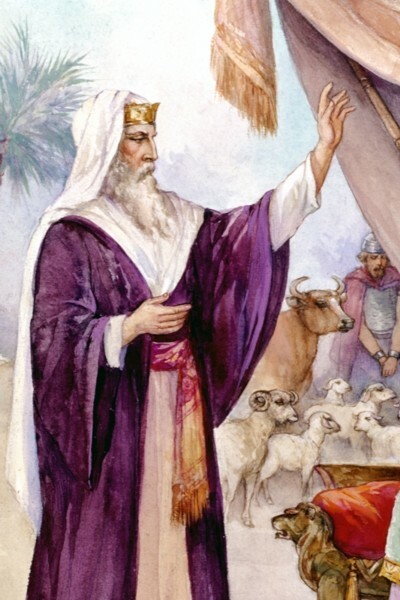 His madness and jealousy of David (in spite of knowing God was on David’s side) drove him to kill all the priests and women and children at Nob (1 Samuel 22:16-21), and Abiathar has fled to be with David. 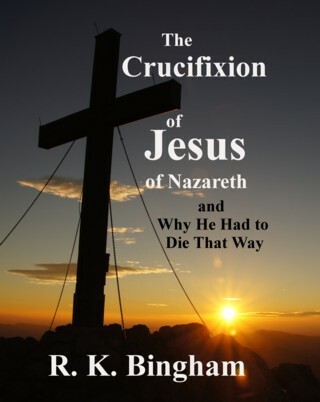 Now the Philistines threaten to split the kingdom in two, and he has cut himself off from God. 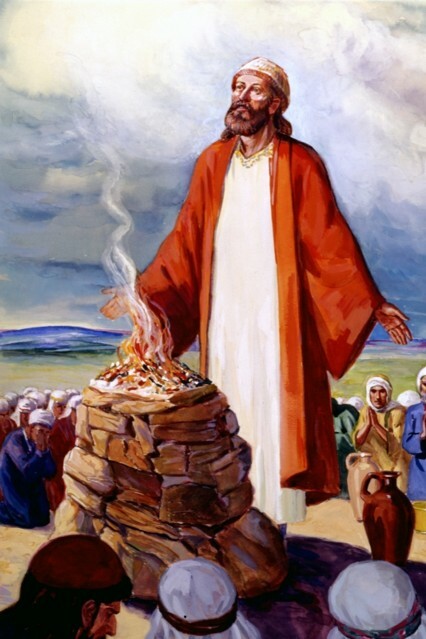 So he decides to consult a medium – expressly forbidden in Leviticus 19:31 and elsewhere. At Endor, he tells the medium to he wants to talk to Samuel. We are not told that it is actually Samuel who does appear, but he speaks of the Lord and of Saul as Samuel would. The surprise and shriek from the woman could indicate that God just allowed it. There is much we do not know about demons in the Bible and of this type of thing that the it strictly warns us from. But whatever the case, the news is not good for Saul, as he is told that he and his sons would all die the next day. Having fasted (probably for this event), the news is the last straw for the weak Samuel. He finally consents to eat somethings at the urging of his servants – with the medium! No man who thought himself righteous would eat in such company under any circumstances in that land and time. 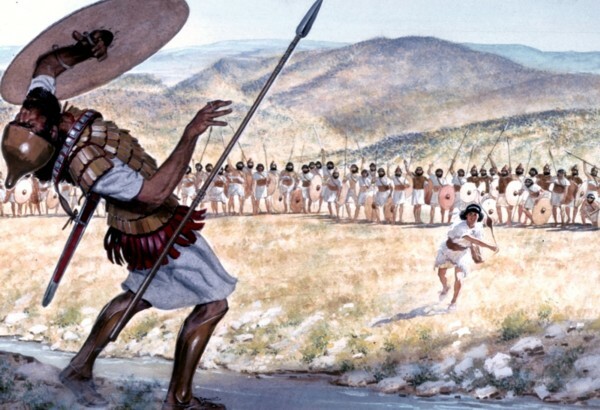 As we move to chapter 19, David’s skill as a warrior is proven, his reputation has grown and Saul has become more jealous and paranoid than ever. 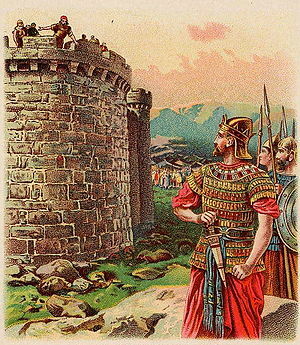 His plan for David to be killed by Philistines backfired, and David’s prowess and reputation increased. As part of that failed plan, Saul had promised his daughter Michal. Now the one he feared most was his son-in-law! Saul knew not only that his daughter loved David, but he also knew that the Lord was with David (1 Samuel 18:28). So by plotting against David, he was fighting against God, and he knew it. What madness! 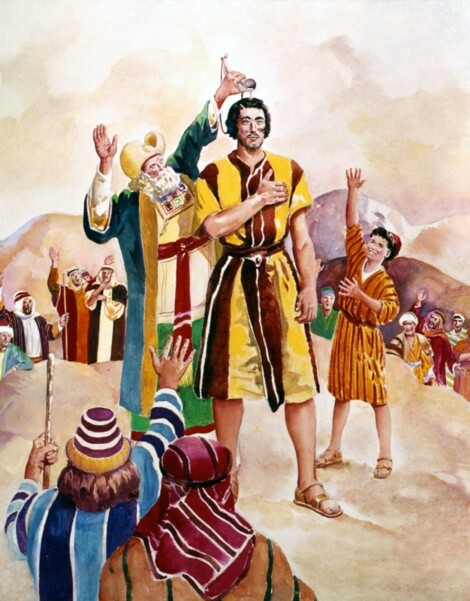 Saul’s son, Jonathan, loved David. Contrary to what some would have you believe, their relationship was simply one of deep brotherly love and respect. Also, we tend to think of them as close in age, but this was probably far from the case. Remember, Jonathan was commanding troops while David was still a very young boy before even being anointed (1 Samuel 13:2-3). So Jonathan intercedes and convinces Saul not to kill David, and he again defeats the Philistines for the kingdom, as war broke out again (verse 8). But God had to get David trained and ready to lead the people. So in His wisdom, He again sent a harmful spirit to Saul. 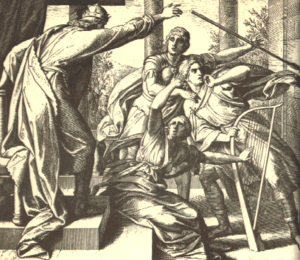 Saul tried to pin David to the wall with his spear when he was playing the lyre in his house, but David escaped. 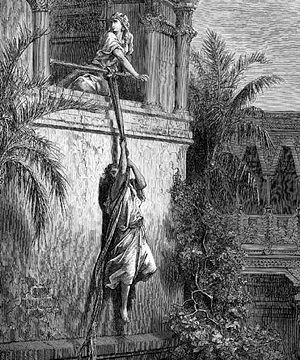 When he sent them to his home, his daughter had already warned David, and he escapes through the window. He went to Samuel, and they went to Naioth in Ramah. In verses 20-24 Saul’s messengers, and even Saul himself are overcome with the Spirit of the lord and Saul is stripped of his kingly robes – just as he would be stripped of his throne. What about the idol from the house of her father that Michal used to deceive her father’s messengers (verses 13-16)? Could be the spoils of war that Saul had kept. he never has been shown in the scripture to be a man after the Lord’s heart – that was David. 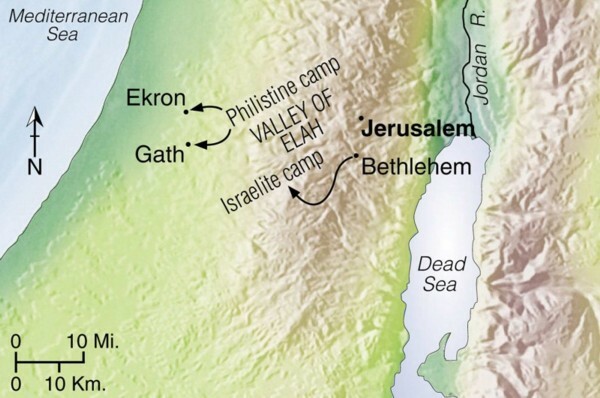 One of the most famous chapters in the Bible begins with the Philistines camped at Socoh and Saul and his army gathered at the Valley of Elah. 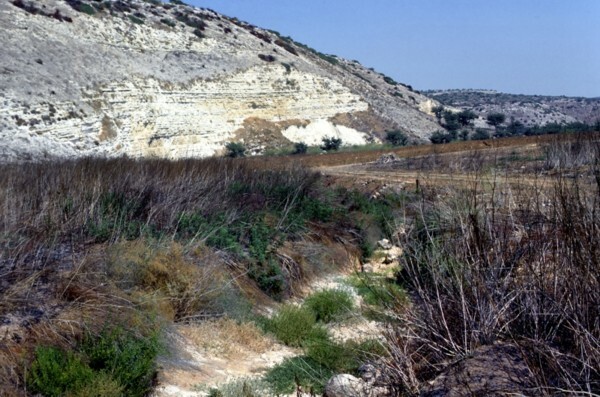 Defeating them here was crucial, as control of this valley would give the Philistines an entrance into the hill country of Judah. Goliath of Gath was their champion. A champion is a man comes forward to fight between the two enemy’s battle lines. Here Goliath challenges on behalf of the Philistines any champion that Israel will dare to confront him. The survivor’s army would share the victory with him. The actual size of this “giant” of a man is much debated, depending on the standard of the cubit one chooses to use (and the poor fellow that . But it is sufficient to say that a warrior, whether approaching either 8 feet or 9 feet tall, would be most intimidating – then and now. Saul consents to let David go and outfits him with his armor, but it was not accustomed to it (verse 39) and sheds it. Armed with his staff, a sling and stones he chose from the brook, he defiantly confronts Goliath, who is insulted by being challenged by such an unimposing enemy and , over-confident, curses David. David tells him he will defeat him because the Lord will deliver him – and that he will cut off his head. 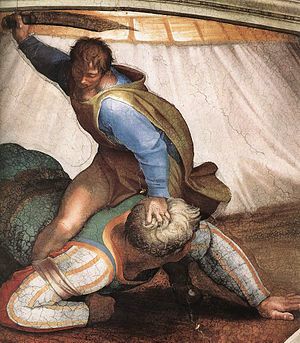 David does strike him to the ground with a stone embedded in his forehead. The Lord was indeed with him. 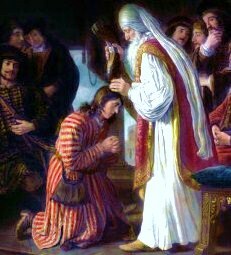 The Lord sends Samuel to the house of Jesse (son of Ruth and Boaz) to anoint one of his sons as the new king. When Samuel arrives, he is sure that the tall one, Eliab, must be the one. But God tells him that he is not, and that He does not judge man by appearance, but by their heart. 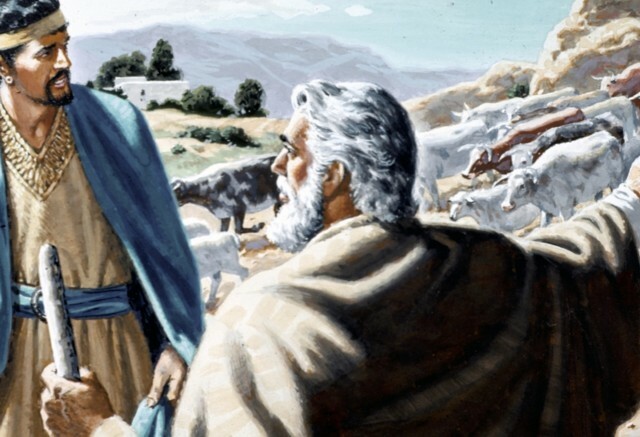 After going through all of Jesse’s sons, he finds that the least likely, David (the youngest, who is tending the sheep) is actually the one. Once again, we find it to be the case that God often uses the one we least expect for His work. Samuel anointed him in verse 13 and “the Spirit of the Lord rushed upon David from that day forward.” Then, verse 14 tells us that “the Spirit of the Lord departed from Saul,” making a significant statement of the rejection and shift of favor. Some commentators take the meaning of the “harmful spirit” that tormented Saul as being a mental disorder. Others see it as more demonic. Either way, Saul clearly is irrational at many times from this point forward. 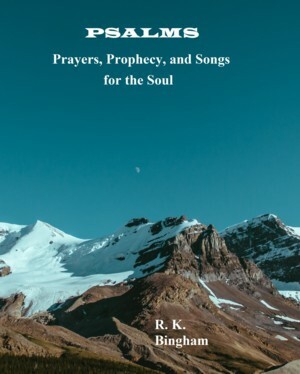 By God’s providence, his servants suggest music to soothe him, and they just happen to know of a skillful musician with a lyre – David, who becomes favored in Saul’s court for this, as well as becoming Saul’s armor-bearer. This chapter shows us the character flaws of Saul. He was the military leader the people had wanted, but it was all about Saul – and never about the Lord; and though victorious, his leadership was often a great model for what a leader should not do. 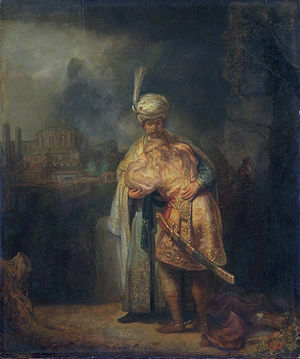 After God had led the people out of Egypt, Amelek attacked them the first time without provocation (Exodus 17:8); and when they were defeated, God told Moses in Exodus 17:14 “…that I will utterly blot out the memory of Amalek…” So Samuel gives Saul God’s instructions in verses 2-3 of this chapter not to spare even the oxen and other livestock. He is victorious, but he spares the Amelekite king Agag and the best of the livestock and brings them back. When God tells Samuel in verse 10 of what Saul has done and of His rejection of Saul as king, Samuel is grieved and very angry with Saul. Worse, he finds out along the way that Saul has built a monument to himself (verse 12). When he arrives, he lets Saul have it with both barrels. Saul at first tries to blame the people (verses 15, 21), but Samuel is having none of it. Not only does he know better, but as he reminds Samuel, as king, he is supposed to be a leader. 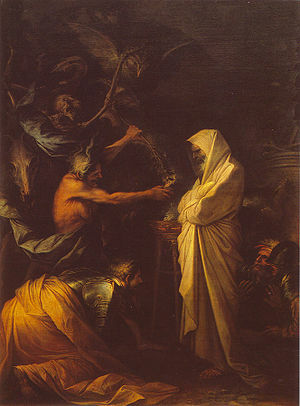 Saul’s final admission of sin is half-hearted, and as Samuel turns from him, Saul desperately grabs his robe and tears it. At this point, Samuel lets him know that his kingdom is being torn from him. But Saul seems to care more about what the people think, than what God thinks of him (verse 30). It would be the last time Samuel will see Saul until he dies, and he grieved (verse 35). This week we will zoom through the rest of 1 Samuel, seeing the big contrast between Saul and David as both leaders, and as servants of the Lord. As we watch Saul come unhinged throughout the week, we will get a closer look at the famous chapter about David and Goliath on Wednesday. Each weekend, I am now posting a small PDF of one week of chapter summaries (on the website’s “Summaries” page), current to the beginning of the previous week. I have posted the summary for Week 18 (April Week 5) of the schedule I am following. 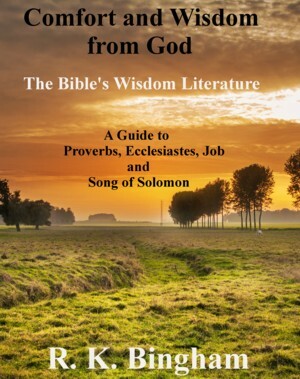 This short PDF document contains condensed comments about 1 Samuel 1, 2, 3, 4 and 5-6, with hyperlinks to the ESV version of each chapter for listening or reading, and joins the summaries for other weeks already posted there. This is not Samuel’s last public address, but it does sound very much like Joshua’s farewell address, especially Joshua 23:1-13. Samuel reminds them of all that God has done for them, and reminds and rebukes them for their lack of loyalty to the Lord. The unseasonable storm of verses 17-18 are not punishment for wanting a king, rather a sign of the Lord’s displeasure at their lack of faith, trust and loyalty to Him. Nevertheless, Samuel warns that all will be well with them and their king as long as they “do not turn aside from following the Lord.” Here, “king” refers to present and future, as verse 25’s warning of them and their king being swept away is prophetic of their fate. The “empty things” of verse 21 refers to idols and idol worship. In a private ceremony, Samuel anoints Saul as king, then tells him of several signs that will prove to him that God has made king (ch. 10 verses 2-7). The term “another heart” simply refers to the Spirit of God rushing upon him and enabling him to become more like who the Lord needs him to be at the time. A timid Saul (ch. 10 verses 21-22) is then presented to the people. The threat from Nahash the Ammonite in 11:2 makes a lot more sense when you learn that one of the Dead Sea scrolls (4QSam) contains an account of that Ammonite king gouging out the eyes of the Gadites and Reubenites on Transjordan – and 7,000 men fleeing to Jabesh-Gilead. When he granted the request for their delay in decision (verse 3), he did not believe they would be getting any help. We find Saul behind the plow (not exactly being treated like a king yet) in verse 5. When told of the threat, the Spirit of the Lord rushes upon Saul, and he does what God had intended for him, hastily putting together an army an defeating the Ammonites. In 11:12-15, we have Saul at last acting like a leader. Better still, he credits God with the victory. How different might things have been if only he had remained that sort of man in the coming chapters?